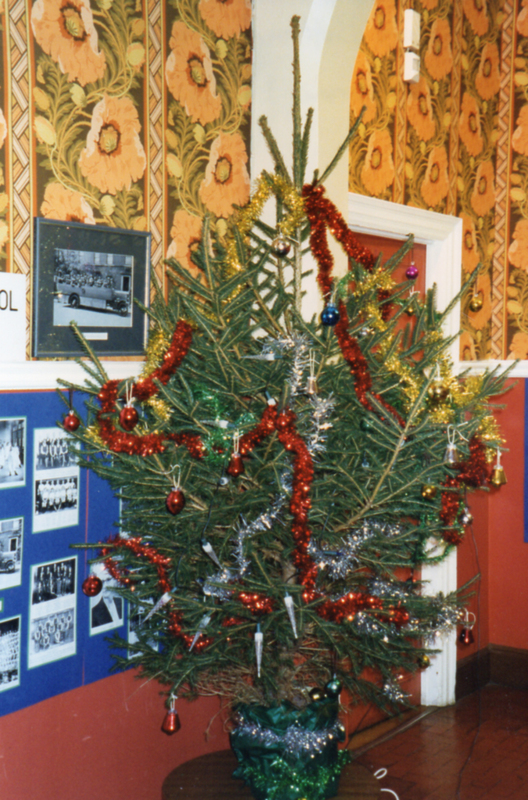 Christmas 1995: the bottom corridor still sporting the ‘infamous’ wallpaper. As you may know, Newcastle High School was founded by the Church Schools’ Company and, because of this, a strong Christian ethos was always at the very heart of the school even before it became The Newcastle upon Tyne Church High School. If I was ever in any doubt over this, it was made clear to me the moment I walked through the door for my interview with Jill Mortiboys, who would become my Head of Department, mentor and a very dear friend. This smiling, vibrant figure in a white blazer, with sleeves pushed up ‘Miami Vice’ style, greeted me with huge apologies for her lateness as “Revd Macey’s Ascension Day assembly for the School had rather overrun.” And so it began. Although I don’t recall the date of this particular ‘Holy Thursday’, the Internet tells me it was May 16th. The Church calendar was on my mind today because January 6th marks ‘The Feast of Epiphany’, or ‘Twelfth Night’ as it is more commonly known. Epiphany Eve is the Twelfth Day of Christmas which brings to an end all yule-tide festivities. It is also the day by which, traditionally, all Christmas Trees must be taken down. And often, as was the case this year, it also coincides with my return to work. The only saving grace today was that it was a Wednesday. The word epiphany means ‘manifestation’ or ‘showing forth’ and this is often what it feels like for me each Wednesday as I venture up the road to ask “What’s new this week?” of the Wates’ workmen. The rate of physical progress each week never ceases to surprise & thrill me and, this particular week, my first visit of 2016, was no different. 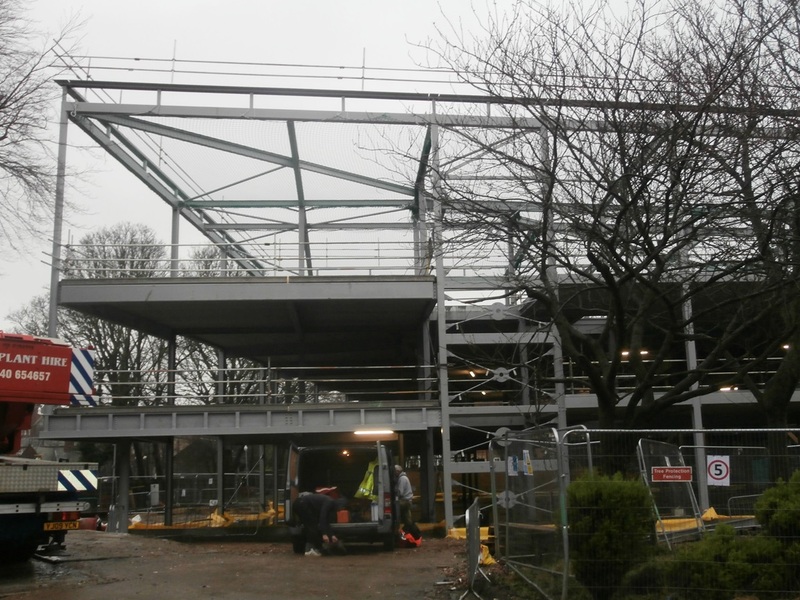 The New Build steel structure ‘saw in’ the New Year complete. Epiphany is also ‘The Day of Lights’, a fact I mused on with some irony. 2016 may be the year that will return the school to Tankerville, but, yet again, another Wednesday camera day had turned out dull and very wet. Shakespeare’s play Twelfth Night: Or, What You Will ends with the song ‘For the rain it raineth every day’ and recently in the North-East this had certainly been the case. 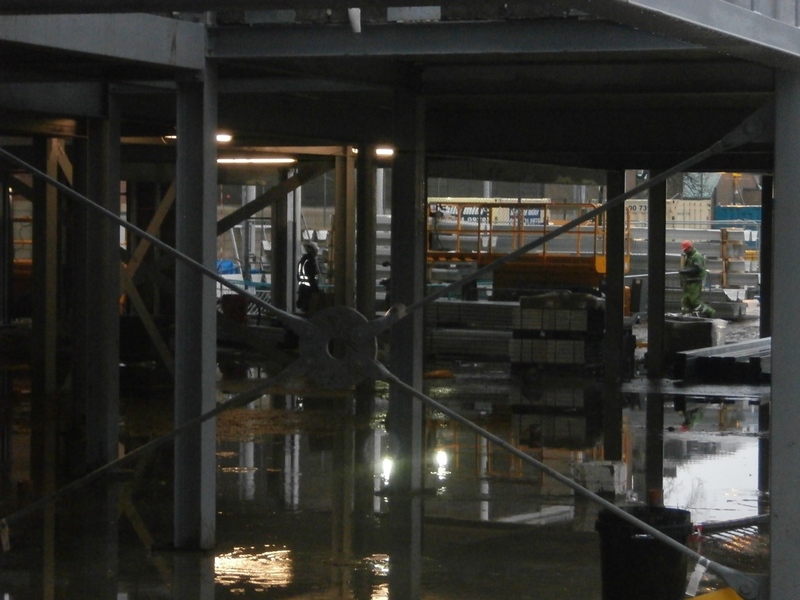 However, despite the incessant rain over the holiday period turning the newly-concreted floor of the new-build steel structure into one big ‘Tankerville Puddle’, it was still exciting to learn that the nondescript stacks of grey material visible in the distance would soon become a roof. The Gateman has told me the construction work continues to draw a steady stream of visitors of all ages to the site gates, the common denominator always being a Church High connection of some sort. However, despite the keen interest in the changes manifesting on the Tankerville site, today turned out to be the day the eyes of the world were much more focused on Jesmond Road, Newcastle High School’s first home, thanks to #DrummondPuddleWatch going viral. The green doors mark three of the four houses on Jesmond Road which first housed Newcastle High School; just off picture, to the left, are the offices of Drummond Central. Drummond Central are the strategic creative agency behind the marketing and sea horse marque for Newcastle High School for Girls. They are also the people who, rather strangely, set up a live ‘feed’ of a puddle near the A167 in Jesmond which ended up being streamed online to people as far away as Denmark and the USA. The ‘Drummond Puddle’ became the centre of a social media storm as thousands logged on to watch passers-by on their way to Newcastle city centre trying to avoid getting their feet wet whilst negotiating a 1.5 metre-wide puddle blocking the end of a pedestrian tunnel under the A167. The Drummond office workers’ mischievous camera-watch and the sheer ingenuity of the folk tackling the puddle both seemed to me very well-suited to ‘tricksy’ Twelfth Night. My hope is that this little ‘puddle interlude’ may have served to brighten up what could otherwise have been a very dull post indeed, the construction team having only been back on the job for two days after their long Christmas break. 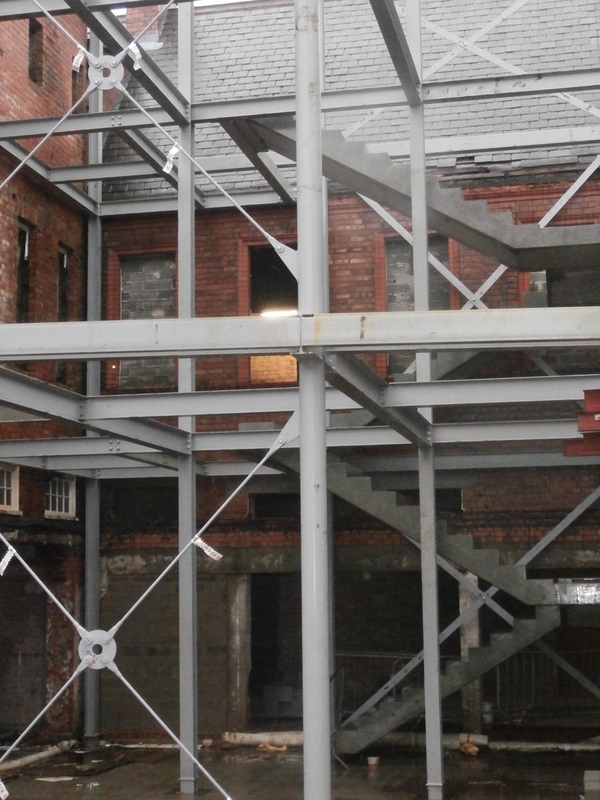 In that short period of time, nevertheless, the steel frame of the new circulation extension to the old building had only just been completed, I was told – indeed it was so new that the tags still remained on the steel in one or two places. 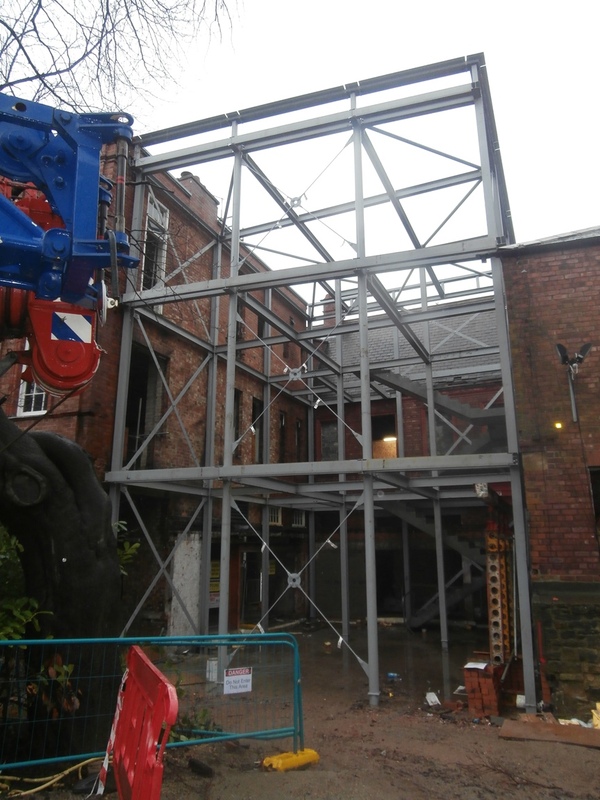 The steel framework of the new circulation extension to the old building is now complete. However, in the context of the on-going construction process, the real epiphany moment on site today for me was the dawning realisation that, deep within the murky depths of the grey steel frame in the fading winter light, I was actually looking directly at a brand new flight of concrete stairs. This jagged ‘stairway to the sky’ was certainly no-where near as attractive as the old, wooden one it was replacing in the building, but this certainly felt like real progress. From now on in 2016, the stairs seemed to be saying, the only way was up. ‘The only way is up’: the new stairs in close-up.